Last week a 34-year-old woman was buried in a Berlin cemetery, far away from her former home in Syria. Like thousands struggling to reach Europe’s southern and eastern borders, she was on her way to the Italian cost. She died at sea, her youngest child, a 2-year-old, is believed to have also perished at sea – its body was never found. The woman stands for the world’s biggest refugee crisis after WWII: about 55 million people are currently on the run, 220,000 attempted to cross the Mediterranean Sea, more than 25,000 people died while trying since the year 2000. With her family’s permission, her body was exhumed in Sicily and buried in a Berlin cemetery as part of a political demonstration called “The Dead are Coming”. The Centre for Political beauty organized the ceremony, reacting on the European government’s failure to carry out a human refugee policy. The reburial became a prelude and also a blueprint to several independently organized protest activities across Europe – all of them to generate attention and pressure leaders to deal with a growing humanitarian crisis. However, „if humanism needs to be declared as art in order to be accepted by society, then our society is running on empty,“ said Philipp Ruch. On last Sunday the activities culminated in a protest march through the heart of Germany’s capital to Chancellor Angela Merkel’s doorstep. 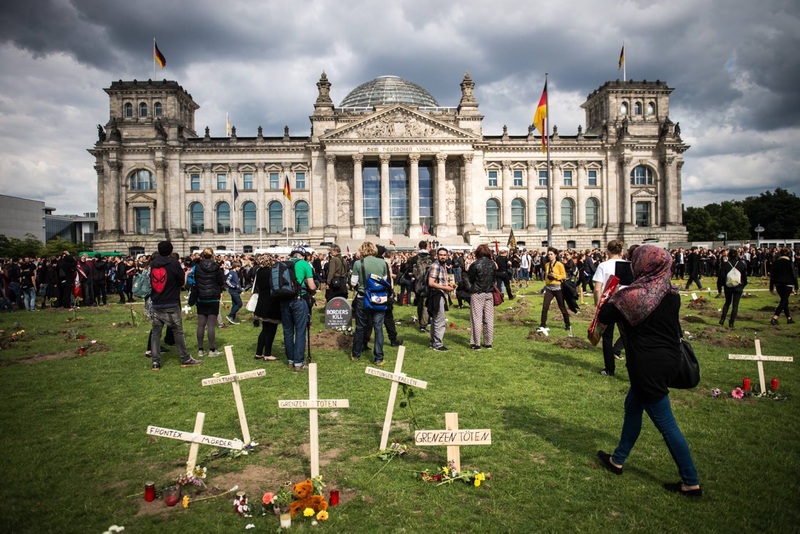 And just there, on the lawn of Germany’s parliament, 5,000 protesters built numerous symbolic tombs on the lawn. The Centre for Political Beauty considers this sort of civil disobedience „Aggressive Humanism“. As they say in an article on Medium, after the disappearance of all 20th century „-isms“ (except capitalism), the idea of human rights remains the last utopia.